The photos of the house were among the first that Plumb would take for her series Dark Days, which will be published this summer by TBW Books in a collection titled Landfall. 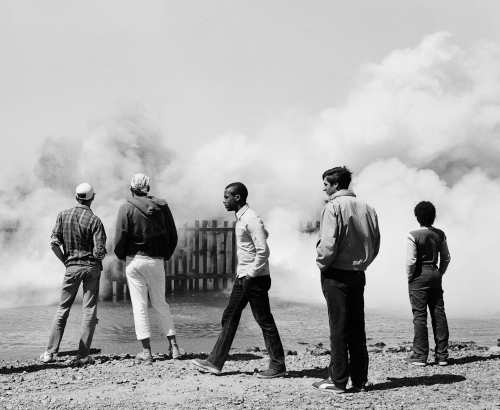 The series includes black-and-white photographs of San Francisco landscapes, portraits of children, and pictures of friends and strangers, often “in odd and disquieting poses, seeking to describe the sense of discomfort I saw both in myself and in my community.” It was the 1980s, a time when Plumb felt the “anxieties of a world spinning out of balance.” Concerns about global warming, civil wars in the Middle East and Central America, and the AIDS epidemic came to define her life and the lives of many others. Plumb’s work references the New Topographics, a group of photographers working in the 1970s who captured man-altered landscapes. But what set Plumb’s photographs apart, what made them so unique and affecting, was that she included people in her work, showing life on the inside, in domestic moments. The series was tucked away until 2015, when Plumb, having retired from teaching black-and-white photography, began going through her archives. She was struck by how much the work — with its themes of nuclear anxiety and environmental decline — “runs eerily parallel to our current situation.” Here, a selection from Dark Days, published for the first time 30 years later.